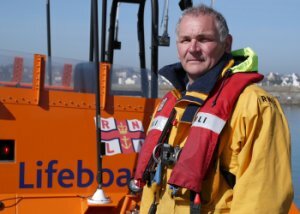 The Coxswain of Donaghadee RNLI, Philip McNamara will be one of the crew members aboard the RNLI’s newest all-weather lifeboat – which will be named Diamond Jubilee in honour of the charity’s Patron, Her Majesty The Queen – when it takes part in the Diamond Jubilee River Thames Pageant on Sunday 3 June. The charity’s latest £2.7M Tamar-class lifeboat, Diamond Jubilee – which will be stationed at Eastbourne Lifeboat Station – will be one of 1,000 vessels making their way along the River Thames on Pageant day. It is set to be the largest flotilla in modern times on the river, with boats of all shapes and sizes stretching for an estimated 12.5 miles. The Queen and other members of the Royal Family will be on board the Royal Barge, Spirit of Chartwell. Crew members aboard Diamond Jubilee represent both Ireland and the UK where the RNLI saves lives at sea. Commenting on the news Donaghadee Coxswain Philip McNamara said: ‘It’s a huge honour to be part of the Diamond Jubilee Thames Pageant, which celebrates the 60-year reign of the charity’s Patron, The Queen. It’s a once-in-a-lifetime event – and a wonderful way to celebrate the extraordinary commitment of Her Majesty, our volunteers, and everyone who supports the RNLI. The RNLI will also be providing inshore lifeboats as safety cover for the duration of the River Thames Diamond Jubilee Pageant. During The Queen’s Diamond Jubilee year, the RNLI is celebrating extraordinary commitment – of The Queen, and the charity’s volunteers and supporters. For more information – or to make a donation – visit www.rnli.org.uk/celebrate.